SEIU Claims Fresno Victory: Now What? When SEIU announced on June 5 that the Fresno home care worker election was “virtually over” and that it had prevailed, skepticism abounded. After all, balloting continued through for another ten days, hard data from the field was lacking, and the rival National Union of Health Workers (NUHW) was getting good reports back from its efforts. But there is growing evidence that SEIU has become the likely winner. And if SEIU does prevail, the question is whether SEIU will use this victory to help unify – rather than further divide – the labor movement. SEIU’s battle to keep 10,000 Fresno, California health care workers from joining rival NUHW has resembled a heavyweight championship fight. Activists and journalists from across the nation have flocked to the Central Valley city, with many seeing the election as a contest between competing visions for the labor movement. In one corner we have the scrappy challenger NUHW, which touts its commitment to worker power and union democracy. In the other we have SEIU, the nation’s largest union, whose reputation for feisty grassroots activism and history of organizing low-wage workers has given way to a perception that it is willing to gain members through weak deals with employers, rather than winning strong contracts through pressure campaigns. 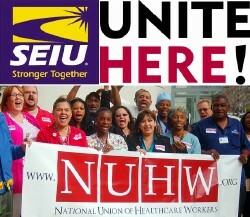 Adding to the election hubbub is the fact that NUHW was formed by the former leaders of SEIU-UHW, who left the union after refusing to accept the transfer of their home and long term care workers to a new statewide local. SEIU has not proceeded with this transfer, and is urging Fresno workers to back SEIU-UHW without referencing future plans. NUHW’s prior relationship with Fresno workers made it the popular pre-election pick, but SEIU appears to have turned the tide. The chief reason is an unexpectedly high voter turnout, likely caused by SEIU’s delegation of 900 outreach workers – likely the largest per worker in labor movement history, considering that only 10,000 are eligible to vote. SEIU has reportedly spent $200,000 a day on its massive staff. When television ads, mailers, and other costs are included, NUHW estimates SEIU’s has spent as much as $10 million on the entire campaign (in contrast, NUHW had little funds and its 150 plus Fresno outreach team is primarily volunteer). While stories abound of SEIU field staff grudgingly participating, and/or spending more time in bars than in the field, the sheer size of the field operation ensured that SEIU could contact home care workers multiple times to secure their vote. As it has done in political elections, SEIU expanded the electorate by getting infrequent and historically low-turnout voters to cast ballots. Elections among home health care workers typically have very low turnouts, and few predicted higher than a 40% turnout in Fresno. This meant 4000 votes, and since NUHW had a strong base with around 3000 identified supporters, the new union was in a very strong position. But as of last week, 6500 ballots had already been cast. The final total could easily exceed 7000, an unprecedented 70% turnout for such workers. By all accounts, this greater than expected turnout benefits SEIU. If SEIU prevails, most will credit its mammoth spending, a messaging blitz that opponents felt resembled employer anti-union campaigns, and the physical isolation of workers in the bargaining unit. But for all the criticism of SEIU’s tactics, nobody should be surprised that it did what it had to do to win. Now that SEIU has apparently staved off an imminent crisis in Fresno, it faces a critical choice. SEIU began the year with high hopes for a stronger, more unified labor movement; its recent conflicts with NUHW and UNITE HERE, however, have divided longtime allies and taken a toll on the union internally. A number of key longtime SEIU staff leaders have left, including Dana Simon, SEIU’s former Massachusetts Hospital Organizing Campaign Director, whose resignation letter stated that he “cannot in clear conscience continue working for SEIU, the union that I have fought for and helped to build since 1996.” Tracy Zeluff, a nearly twenty-year veteran who headed SEIU’s California State Council, announced her resignation during the Fresno campaign, and Fred Ross Jr. left SEIU after only recently heading the union’s biggest organizing drive. These and other talented SEIU organizers are not easily replaced. And even if SEIU avoids defeat in Fresno, its conflict with NUHW will continue to require extra resources, all while the union’s membership is battling steep wage cuts and layoffs in California and other states. SEIU can use the Fresno victory to regroup, and to get back to what were historically its primary purposes of servicing members and organizing janitors and health care workers. But SEIU President Andy Stern may have different plans. On June 4, Stern issued a public letter to “The American Labor Movement” stating that if SEIU’s battle with UNITE HERE is not resolved by the end of June, “we are prepared to respond vigorously” to UNITE HERE and “defend our union.” The letter’s confrontational tone and its questionable accusations that UNITE HERE rather than SEIU started the fight undercut Stern’s stated desire for peace, as did his demand that UNITE HERE accept binding arbitration of all outstanding issues; John Wilhelm, President of UNITE HERE, rejected this identical demand weeks ago, insisting it is unacceptable. So at a time when one would expect SEIU to be trying to unify the labor movement in support of struggles for the Employee Free Choice Act and universal health care, the union could soon escalate its attacks on UNITE HERE. In a possible sign that SEIU is moving in this direction, last week the union’s Executive Board elected two new Executive Vice-Presidents: Director of Property Services Mitch Ackerman and former UNITE HERE President Bruce Raynor. This does not bode well for labor peace. It was Raynor’s dispute with UNITE HERE that got SEIU involved in the fight, while Ackerman is reported to be among the SEIU leaders aggressively pushing to raid UNITE HERE jurisdictions. One gets the sense that SEIU is advancing the careers of those most comfortable on a war footing. Meanwhile, longtime staffers who joined SEIU to organize against employers –not other unions – are departing, and SEIU’s once primary objective of health care organizing has virtually ground to a halt. If SEIU prevails in Fresno, let’s hope it sees it as an opportunity to heal wounds and forge labor unity, and recognizes that spending millions on internal labor fights is not sustainable. When there is clear opportunity to achieve peace with UNITE HERE, escalation should not be an option.